‘The Blights of the Round Table’ © By Joe Canning 2014. All Rights Reserved. © By Joe Canning 2014. All Rights Reserved. they held the lives of millions in their hands. Who planned a starving nation to devour. from the likes of patronising Nassau Senior. referring to a poor and dwindling people. transported beaten people without care. When truth was far Quebec and more despair. his cure for Ireland’s woes was, “Day of prayer”. that cleared the land without a hint of conscience. when told that fever kills the hungry man. young girls abroad he sent for impregnation. exposed them then to lives of indignation. when scoundrels vanish in the mists of time. Photo: “The Unstemmed Exodus” (Irish World, 10 March 1877). 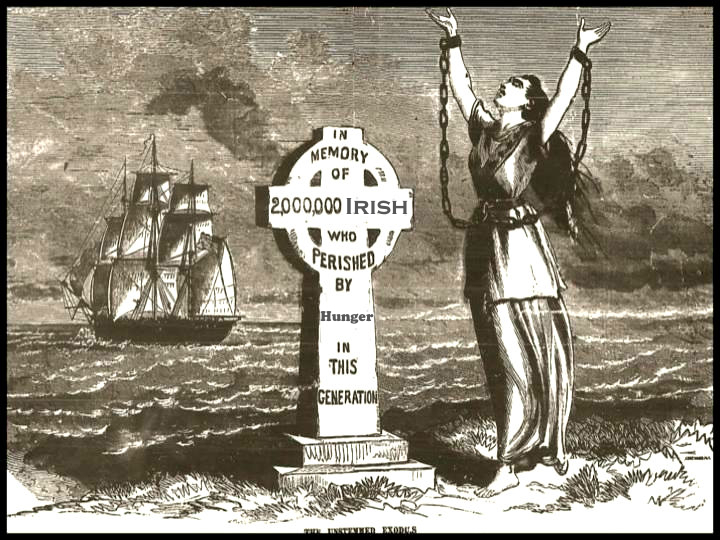 Ireland is a damsel in distress lamenting the dual afflictions of mass migration and mortality that have affected Ireland since the Great Hunger (1845-1852). Stair na hÉireann and Joe Canning asks you to take the time to please consider supporting this very important petition. Irish Holocaust – Not Famine. The Push to educate in facts. We can now prove beyond doubt that more food than was required to feed the Irish people during the period (1845-1850), was exported out of Irish ports under armed guard. This is not a petition of Acrimony, Discord or Hate, this is a petition for Truth! Please sign with your family, and ask your friends and their families to consider. In Proud and Loving memory of our Forefathers, and the Truth that our Children Deserve.